A nice way to use the early spring greens is in cooked or baked main dishes, where their bright colors and interesting flavors turn ordinary recipes into something special. One of our favorites is Quiche Lorraine with California Native Greens. It goes well with a salad of Miner’s lettuce (Claytonia perfoliata). You can use any of the edible leafy native greens for this recipe (for a list of edible native greens see: http://www.slideshare.net/cvadheim/gourmet-greenslist) After you’ve tasted the various greens you’ll discover your favorites. For this recipe we favor the mild-flavored leaves of Southern Island Mallow (Lavatera assurgentiflora ssp. glabra), although Atriplex, Camissonia or Mimulus would also work well. The young leaves of Southern Island mallow can be used throughout the year – another plus. We like to include a little bit of Black Sage (Salvia mellifera), Munz’ Sage (Salvia munzii) or Purple Sage (Salvia leucophylla) to add more California flavor. Prepare the baked pie shell. Let cool. Remove tough stems (if any) from greens. Wash Salvia and native greens; dice Salvia finely. Press native greens into a ball to make them easier to cut. Slice the greens into thin strips. Heat the olive oil in a frying pan. 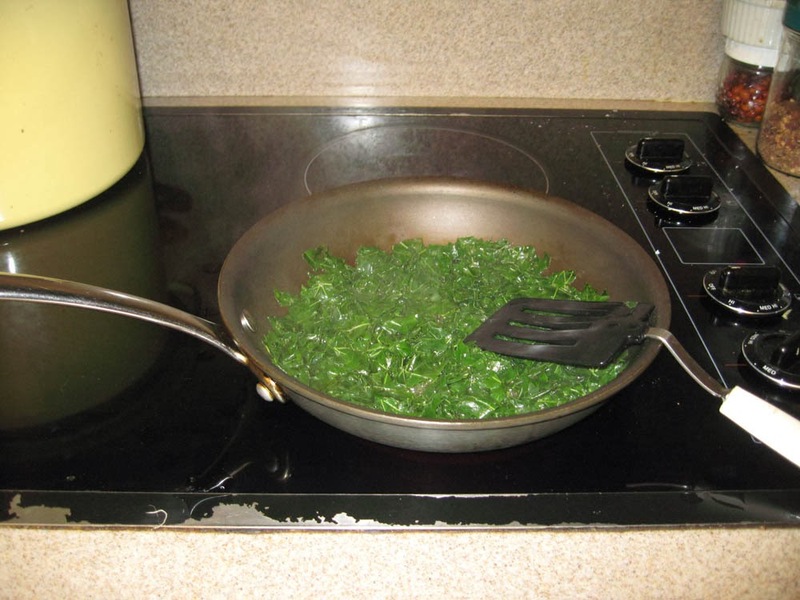 Add sliced greens and salvia; cook, stirring often, until greens are wilted. Add water, cover, and sauté on low heat until tender (3-4 minutes); uncover and let water evaporate. Crumble bacon (if used) and spread cooked meat, onions, grated cheese and greens evenly in the pie shell. If desired, retain one Tbsp. of the onions and bacon for a topping. In a pan or in the microwave heat milk to boiling; remove from heat. Beat the eggs; mix in salt and nutmeg. Gradually pour hot milk into the egg mixture, stirring to mix. Carefully pour mixture into pie shell; sprinkle with topping. Bake at 325° F for 30-45 minutes, or until knife inserted into center comes out clean. Let stand several minutes before cutting. Serve hot. Delish! Designing Your New California Garden: 9. Managing Water – Part 1. Water Goals, Water Zones (Aqua-Zones) and Harvesting Rain. This month we start planning your garden in earnest. 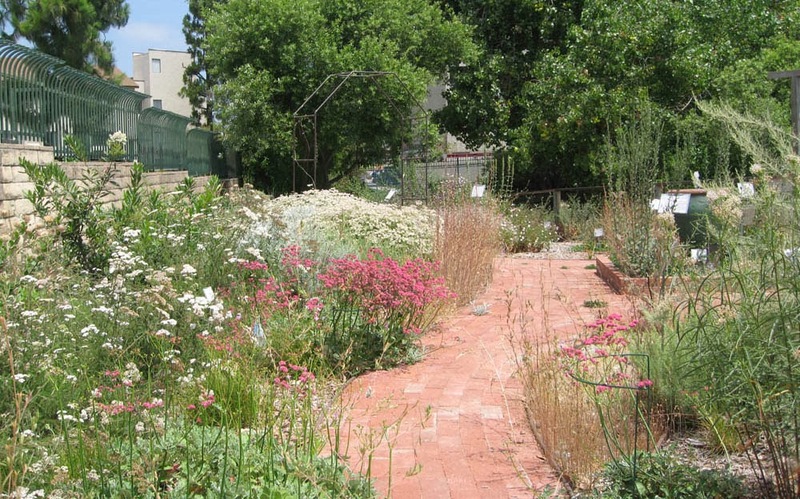 If you’re just joining the ‘Designing Your New California Garden’ series, we suggest you start at the beginning (July 2013 - http://mother-natures-backyard.blogspot.com/2013/07/designing-your-new-california-garden-1.html) and work forward. The monthly activities will help you design an attractive, functional, sustainable and water-wise garden. Last month we envisioned your new garden: its overall look and the features you want to include. This month we take the background information and begin to actually design the garden, starting with the water management system. So take out your Garden Notebook, grab a cup of your favorite beverage and let’s get to work. Local gardeners need to seriously reconsider their garden water management. Climate change will almost certainly mean less water for gardens. Californians should view the past two drought years as a wake-up call; it’s time to make your garden more water efficient. The traditional approach to water management was to install a sprinkler system that watered the entire yard. With increasingly sophisticated technology, many of us divided our gardens into irrigation zones/’stations’ that could be watered separately. This helped conserve water in many California gardens because it allowed for flexible irrigation schedules. The New California Garden approach takes water management to a whole new level. It starts with defining water goals for your garden. It asks you to carefully consider how you ‘spend’ your water budget, prioritizing water for the plants most important to your family. And it involves working with the natural conditions in your yard; working ‘with Mother Nature’ rather than against her. While this may sound difficult, in fact it’s fairly easy. You will need to do the planning work and adopt a new paradigm for water management. But once your garden management system is in place, water management becomes easy. Start by reviewing your Water Goals. If you haven’t defined them, now is a good time to visit our November, 2013 posting on Assessing Your Family’s Needs (Functional Analysis). You’ll need to work through the Water Goals exercises before you can design your water management system. You must understand your starting point – and where you want to end up. And only you can set your water goals and priorities. Let’s look again at our example garden at 112 Willow Street. 112 Willow represents a fairly typical S. California yard. It has lots of good features, which we explored and mapped in August, 2013. We’ve conducted a functional analysis of the garden (September, 2013) and mapped functional areas (November, 2013). Part of the latest mapping exercise involved looking closely at the physical attributes of the site. You might want to re-read the November posting to prepare for today’s session. As seen below, we want to decrease overall water usage at 112 Willow Street. There are areas in the new garden (the vegetable garden; possibly the new ‘lawn area’) that will need regular water. These areas are important to the gardeners so they’ve chosen to ‘spend’ water on them. But we’ll have to balance them with areas that need less water. The front yard is landscaped in a low groundcover. It’s not very exciting and doesn’t attract many birds or butterflies. But it is evergreen, established and fairly water-wise (it’s only watered once every 10 days, even in summer). We’ve decided to retain the current front yard landscape, at least for the next few years, and then re-evaluate. It’s perfectly fine to re-landscape your garden in segments – and to preserve existing plants that are functional, attractive or important to your family. 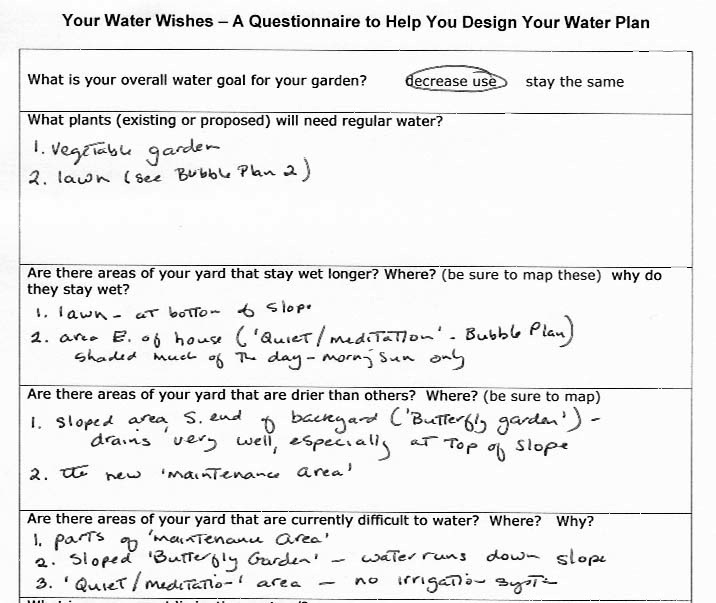 However we suggest that you consider the entire yard when designing your Water Management Plan and your hardscape (March 2014). Irrigation systems, walkways, rain harvesting systems etc. work better if the entire yard is planned as a whole, even though individual parts may be installed over time. For example, modifications to the backyard irrigation system may require modifications in the front yard. And traffic flow needs to be considered for the whole outdoor area. In the Water Goals analysis we’ve identified areas at 112 Willow that tend to stay moist and others that dry out quickly. We’ve also discovered a few areas that are ‘difficult to irrigate’ due either to physical characteristics of the site (for example, on a slope) or characteristics of the current irrigation system. Now comes the creative part: we’re going to take what we know about the site and use that knowledge to design an integrated water management system for the garden. 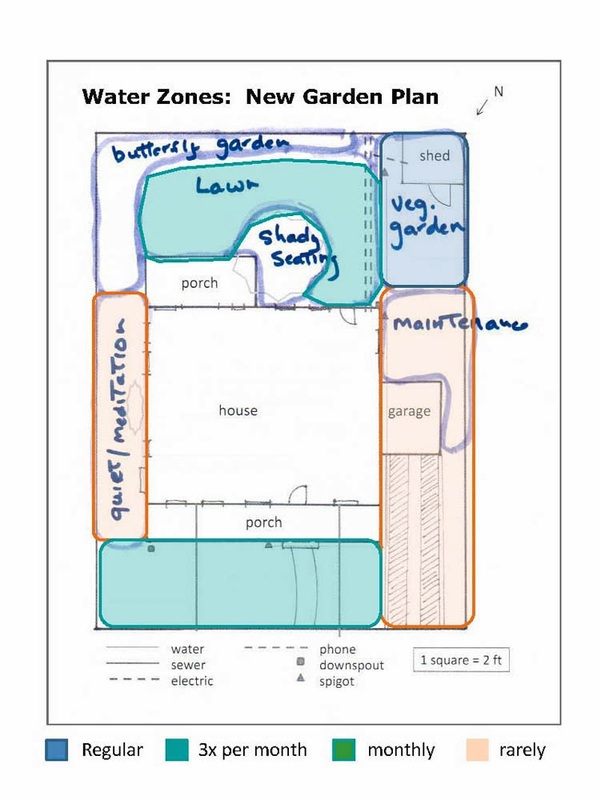 The first step is to create a Water Zone Plan, the underlying foundation of a water-efficient garden. The first step in creating a Water-Zone Plan is mapping the existing irrigation conditions. We’ve created such a map for 112 Willow Street (below). You can see that most of the backyard receives regular water (Water Zone 3). It’s all on one sprinkler system – and the watering schedule is based on keeping the sod lawn green. Much of the current water budget is spent on the backyard. The side yards only receive monthly hose waterings – just enough to keep the existing plants alive. If we look closely at the existing Water-Zone map, it’s clear that the backyard will need to be re-Zoned if we want to decrease water use. Currently, about 75% of the garden is watered at least three times a month; 45% is watered regularly. Change is obviously needed; but how to proceed? The key to Water Zone gardening is the placement of water zones. 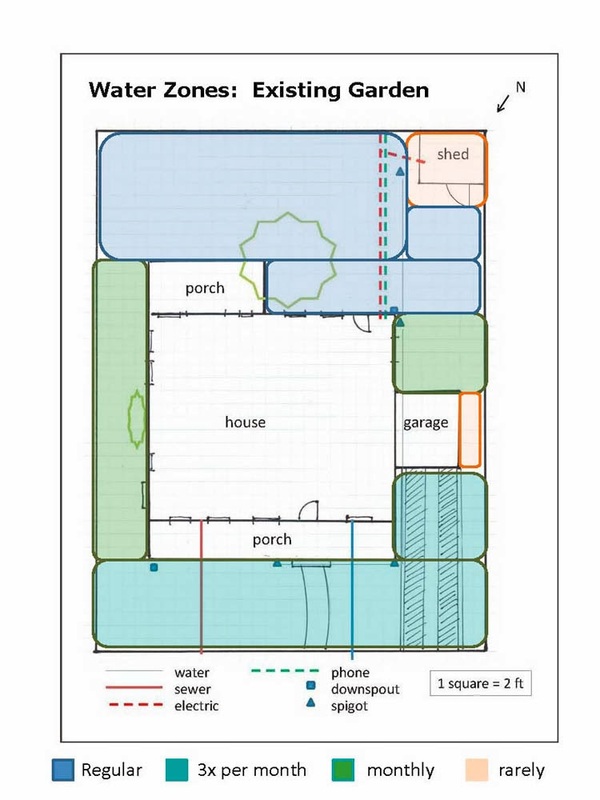 This can be tricky because optimal placement depends on site physical characteristics as well as the uses planned for each area of the garden. The 112 Willow site includes some physical features that directly impact a water management system. As seen above, some areas are naturally moist while others dry out more quickly. Some areas receive more sunlight and wind than others. In fact, we already considered many of these factors when designing our final functional area map (November, 2013). One of the easiest ways to approach Water Zone planning is to first map the obvious areas: areas that will need regular water and those that could require none. 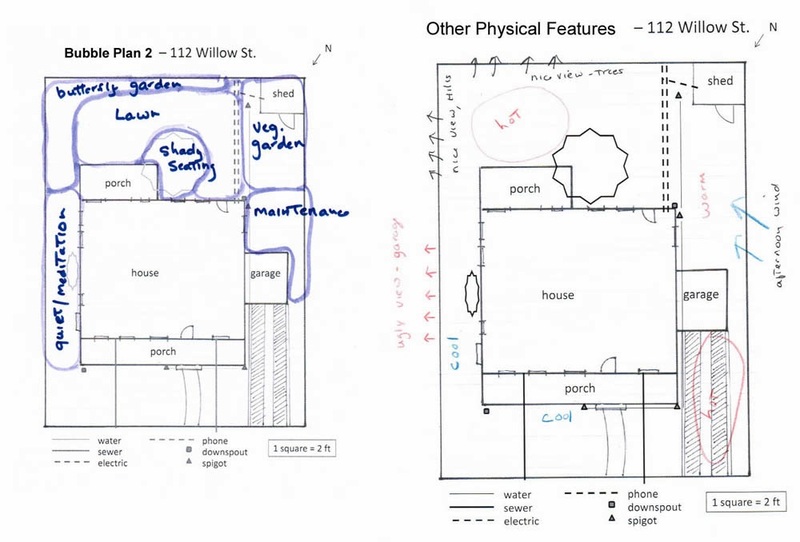 We’ve mapped the ‘obvious’ areas for 112 Willow St. above. Mapping these areas can result in sudden flashes of insight. 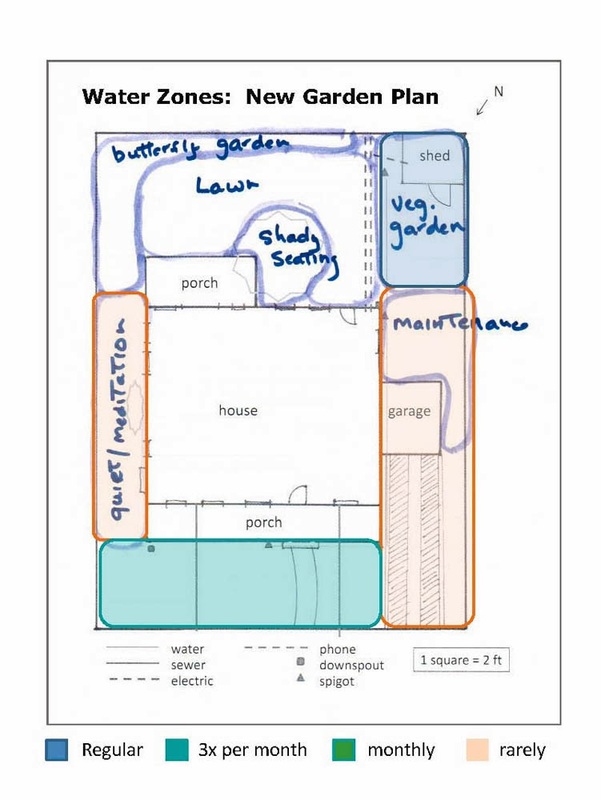 The vegetable garden will require regular water, so we’ve mapped it as Water Zone 3. On the other extreme, the maintenance area could be ‘paved’ with a permeable hardscape like gravel, crushed rock or pavers (Water Zone 1). This would be a great solution, providing a solid work surface that requires no water at all. While considering the ‘maintenance’ area, we realize that we could extend this Water Zone 1 area by removing the existing groundcover around the driveway. The groundcover is difficult to water in that area – and doesn’t look that great. We’ll have to consider our choice of hardscape carefully (next month). But converting the driveway area to permeable hardscape could significantly decrease water use in the front yard and require just a little extra effort and cost. The driveway area is not a high priority area in terms of usage, so converting it to Zone 1 probably makes sense. We also decide that the eastern side yard could easily be managed with little water. We’ll have to choose our plants carefully and perhaps limit the number of plants. But a few well-chosen plants – with some inspirational hardscape – can turn this area into a shady spot for reading, meditation and other quiet pursuits. The afternoon shade makes this area a good candidate for Zone 1 or 1-2 (watered deeply several times a summer). 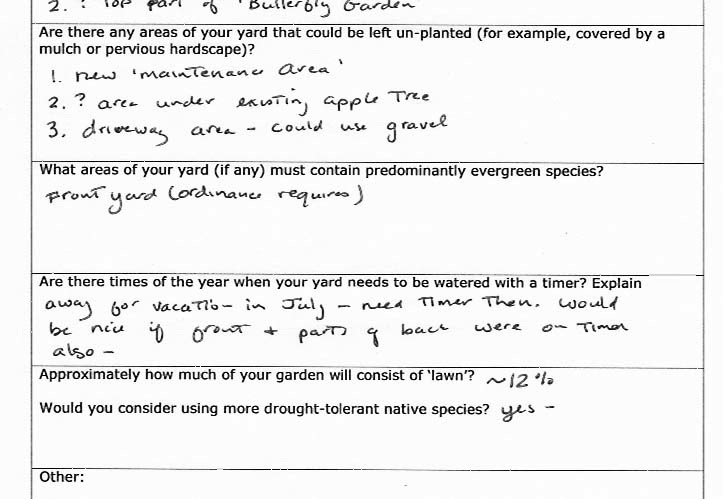 According to our Water Goals (above) we’d like to consider a water-wise grass for the new, smaller lawn area. Our site assessment shows that the lawn will be well-watered most winters; we’ve located it in a low spot that tends to stay moist. But it will need some summer water. Let’s assume it will need irrigation 3 times a month in summer; we can revise this based the actual grass we choose. 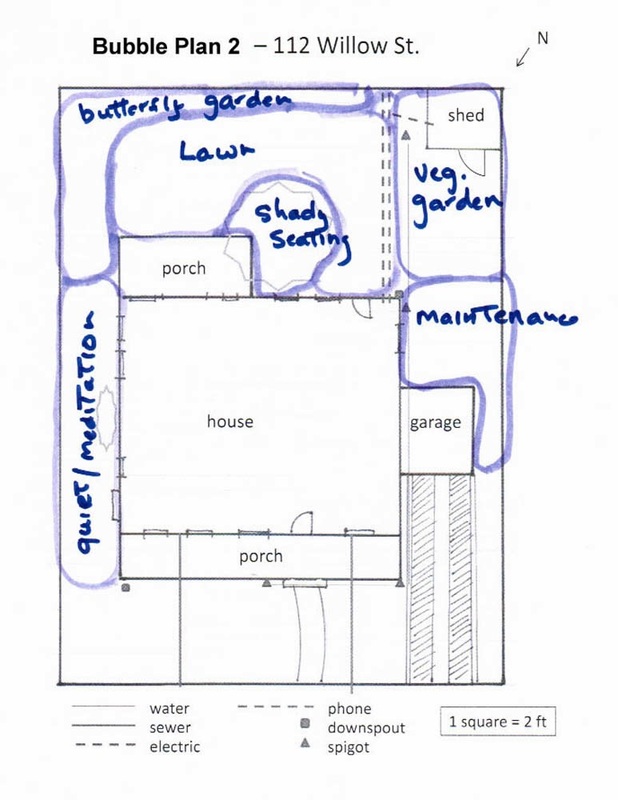 We map the ‘lawn area’ (Zone 2-3, below) then consider what to do with the ‘shady seating area’ under the apple tree. We know from our site physical assessment that very little grows in the shade under the apple tree. We could use hardscape to create our seating area; we’ve seen nice examples surfaced in gravel or crushed rock. But we decide to plant at least part with a water-wise native ground cover (Water Zone 2). This will work well for our apple tree, which is established and requires only occasional water. The area will likely also receive some water when the ‘lawn area’ is irrigated. The new ‘butterfly garden’ presents some water management challenges. The area slopes down to the new lawn. It’s difficult to water and the top of the slope (south side) dries out in warm weather; it would be helpful to water this area less frequently. But the area also provides views from the house and patio, so it needs to look nice, particularly in spring/summer. We’ll need to satisfy both requirements with our Water Zone plan. We’ve located the butterfly garden wisely, in this sunny part of the garden. We’ll want to use plants native to S. California to attract the local butterflies. Fortunately, many native ‘butterfly plants’ are quite drought tolerant once established. If we choose carefully, we’ll be able to water this area once a month or so in summer. We decide that the butterfly garden can easily be assigned to Water Zone 2. Looking at the final Water Zone Plan, we’re impressed by the difference between it and the existing conditions. Approximately half of the new garden (including front yard) will require water once a month or less – a full 1/3 will need no water at all! Only the vegetable garden will need regular water. Since growing vegetables is an important activity, the gardeners are happy to spend more of their water budget on the vegetable garden - and much less on areas that are less important. We’ve got a workable plan! Determine your overall water goal – often to decrease water usage; you may want to specify the amount of decrease you desire. Map out your current water use distribution – to determine where your water budget currently is spent. Roughly calculate the percentage that requires regular water (you may be surprised!). Study the maps created for your site physical assessment. They may suggest areas that are already more moist or dry based on soil conditions, topography, light and wind patterns or other factors. You will use this information to guide the placement of Water Zones. Review your final Bubble Map. Are the use areas compatible with the physical conditions? If not, modify the map. Take a copy of your final Bubble Plan (map of activity/use areas). Map areas that could require no water at all (examples: unplanted areas like seating areas; areas just covered with mulch, including gravel or other inorganic mulch; areas planted with some highly drought-tolerant California native plants, particularly those native to Southern California; areas utilizing desert plants). Roughly calculate the area that will require regular water. Compare it to the percentage in your current garden. You may find that you’ve already reached your goal for decreased water use. If not, these calculations will indicate how much of the rest of the garden will need to be Zone 1 or Zone 2. 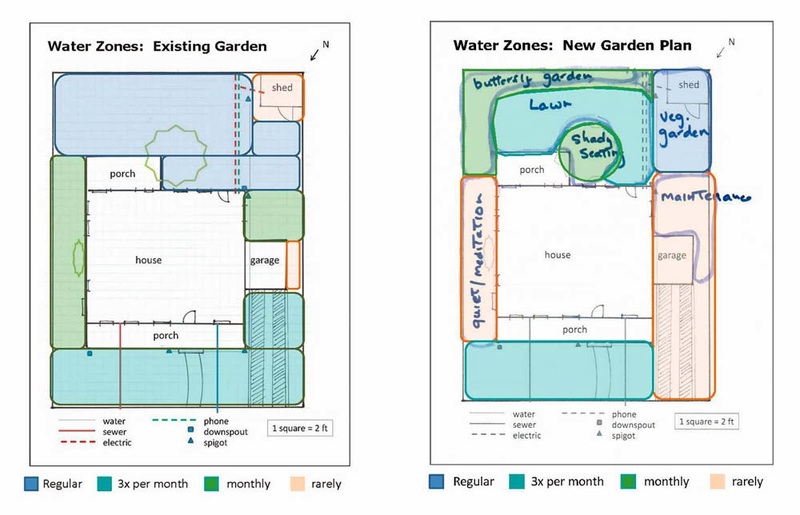 Assign Water Zones to the remaining areas of the garden. This must be based on a realistic assessment of the physical characteristics of the site as well as the functional needs of each area. Be creative: you may be able to use attractive hardscape (pavers; stones; statuary) and judicious use of plants to create an attractive oasis that requires very little water. We’ll consider hardscape matters next month. Create your final Water Zone Map, realizing that you may need to modify the map when you choose your hardscape and plants. Garden water management should include strategies for managing rain. Rainwater is clean, free water. Inhabitants of other dry and Mediterranean climates (for example S. Africa, Australia and even parts of the U.S. Southwest) have long made use of every drop of rainwater. We can learn a lot from them. Among the techniques they use are: saving rainwater for later use; diverting roof runoff for use in the garden; creating holding basins to allow water to percolate into the ground; using pervious pavement/hardscape and more. You may want to include one or more of these strategies in your New California Garden. We’ve discussed several of them in previous postings. Hopefully you’re now inspired to include some rain management methods in your own New California Garden. After reading about harvesting rain, the gardeners at 112 Willow Street added several new ideas for using rainwater to their Water Goals. As noted on the map below, the house already has gutters front and back. There’s currently no gutter on the patio – a source of irritation and drenchings during the rainy season. We decide to add a gutter and downspout that will direct water from the patio roof to deep water the apple tree. The back gutter drains to the west. In fact, the area near the kitchen door is often muddy after a rainstorm because of the downspout location. 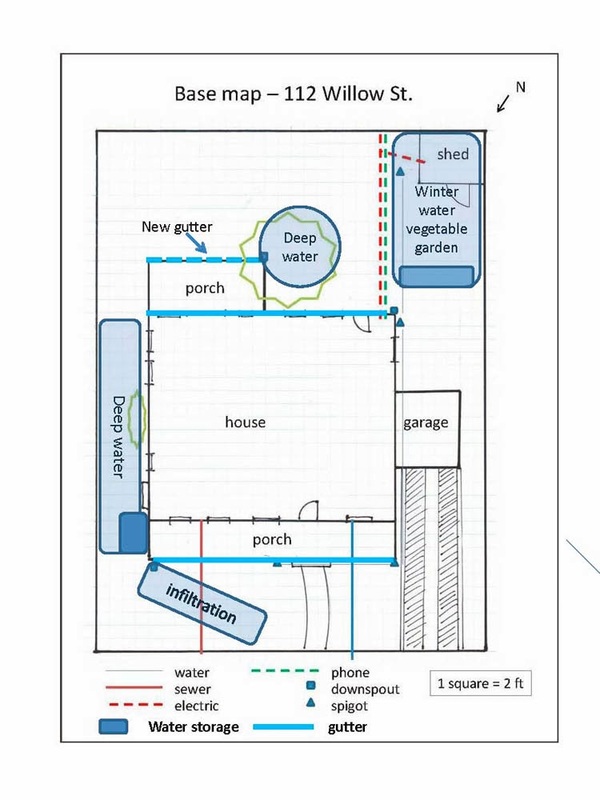 Fortunately, the downspout is close to the proposed vegetable garden; the gardeners would like to use this water to irrigate the vegetable garden in winter/spring. Is this feasible? First we’ll need to calculate how much water we’d actually harvest from the back roof during a typical storm. We discuss how to do the calculations in our posting on rain gardens and vegetated swales (above). Calculating the amount of runoff is fairly straightforward. Let’s assume that a good winter storm delivers ¾ inch of rain. We do the calculations and are surprised that the back drainage will deliver 38 cubic feet (or 284 gallons) of water during a good winter storm. The front drainage will produce even more: 57 cubic feet or about 426 gallons. That’s a lot of water! The gardeners at 112 Willow Street have several options for their back roof drainage. If they’re concerned about the volume of water, they can split the drainage so part drains to the east and part to the west. That option requires some work on the existing gutter and installing a new downspout on the east side. But it will insure that rainstorms don’t overwhelm the vegetable garden and will also supply water to the ‘meditation garden’. Alternatively, the gardeners may decide to incorporate rainwater storage into the vegetable garden. For example, three 50-gallon rain barrels, connected together in series, could store half of the water from a typical storm. The overflow could be used to deep water the vegetable garden. A larger storage container (often 300-600 gallon capacity) could store all of the runoff from a typical storm. The water could then be used during dry periods in winter and spring. 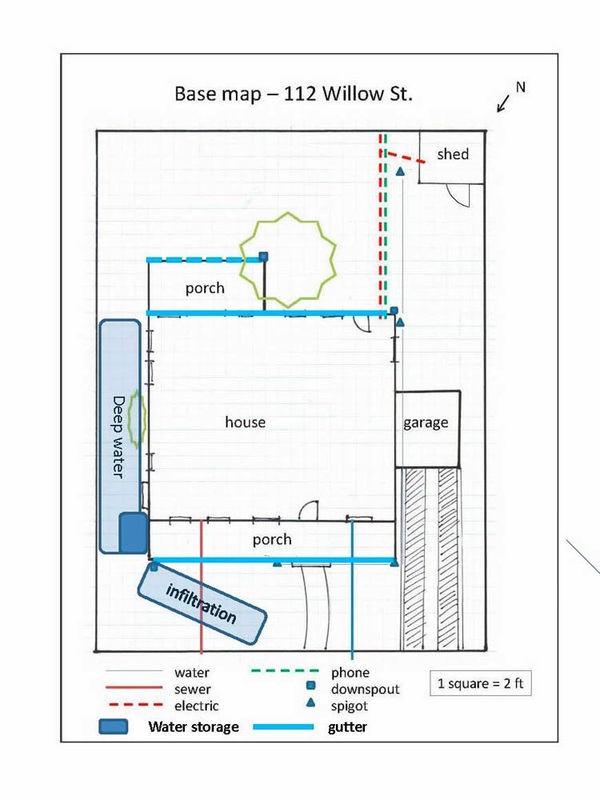 We’ll have to design a creative solution for getting the water from the downspout to the garden area. 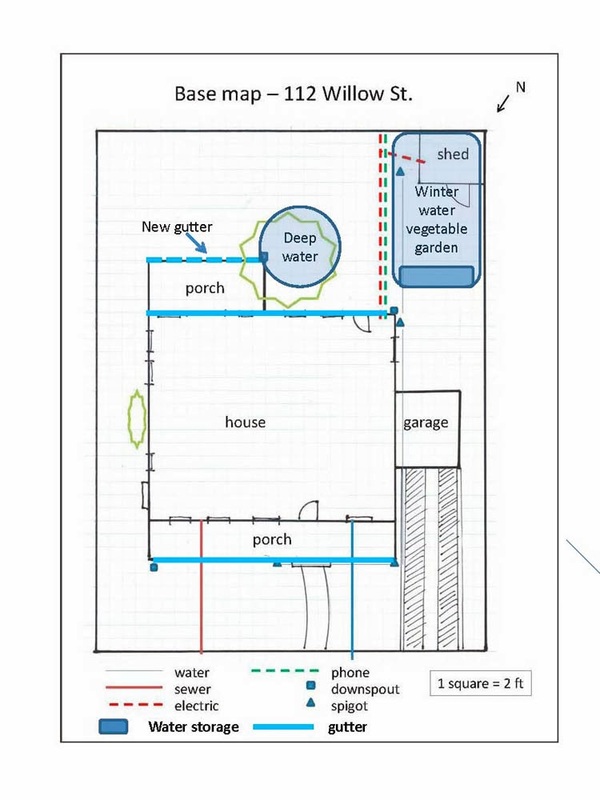 Water enters most water storage containers from the top; and the bottom of the storage container(s) will need to be above the level of the garden beds to allow for gravity-fed irrigation. So the water will likely have to pass over a walkway into the garden. Perhaps an entry arch between house and vegetable garden? 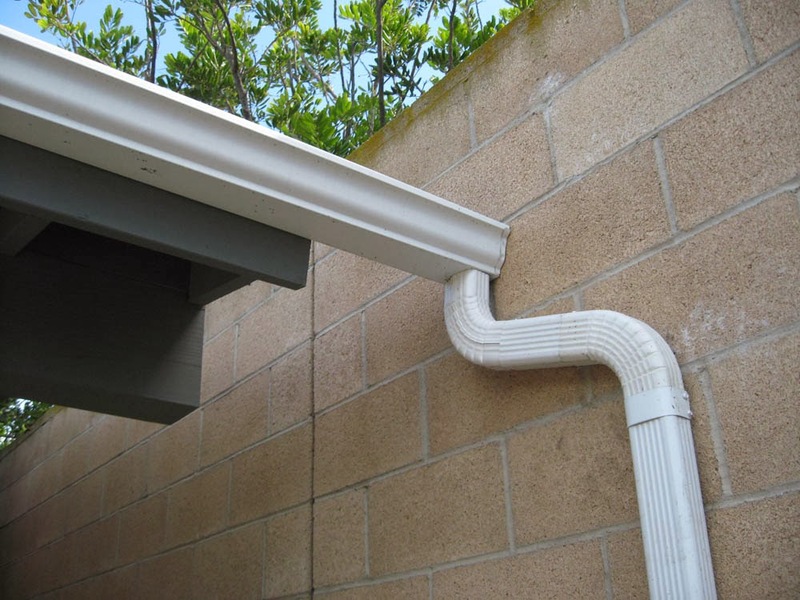 It could incorporate a downspout extension to convey water from the downspout directly to the storage container(s). A nice arch would also help to hide the maintenance area from view. The runoff from the front roof also requires some thought. Most of the water currently runs into the street – a waste of 400 gallons with each rainstorm. Our homeowners might consider building a water infiltration system in their front yard. For example, a dry swale would make the front yard more interesting while allowing rainwater to percolate into the ground. The resulting deep watering might extend the irrigation-free period each spring. The gardeners at 112 Willow might also consider locating a large water storage container near the downspout on the northeast side of the house. A shrub or trellis could hide the functional-looking storage container from the street. The water could then be used to irrigate the ‘meditation garden’ in spring and summer. The gardeners decide they want the best of both worlds: they will split the water from the NE downspout. Half will be saved and the other half will infiltrate into the front yard. This system won’t be implemented right away – funds and time are limited this year. But it will ultimately form an important part of the water management system for the entire yard. We’ve come a long way towards designing a water management system. Next month (March 2014) we’ll explore designing an irrigation system, water features and pulling the water management system together. Every garden needs a bit color this time of year. The locally native currant and gooseberry bushes (genus Ribes) are among the most reliable early bloomers in local gardens. Our Golden Currant has bloomed now for several weeks and should provide a welcome spot of ‘gold’ for a few more weeks (see above). The genus Ribes is a member of the Currant family, the Grossulariaceae. Some taxonomists have placed Ribes in the Saxifrage family, although its members differ significantly from Saxifragaceae. Grossulariaceae is notable for woody deciduous shrubs that produce edible berries; the Saxifrages are herbaceous with dry fruits. 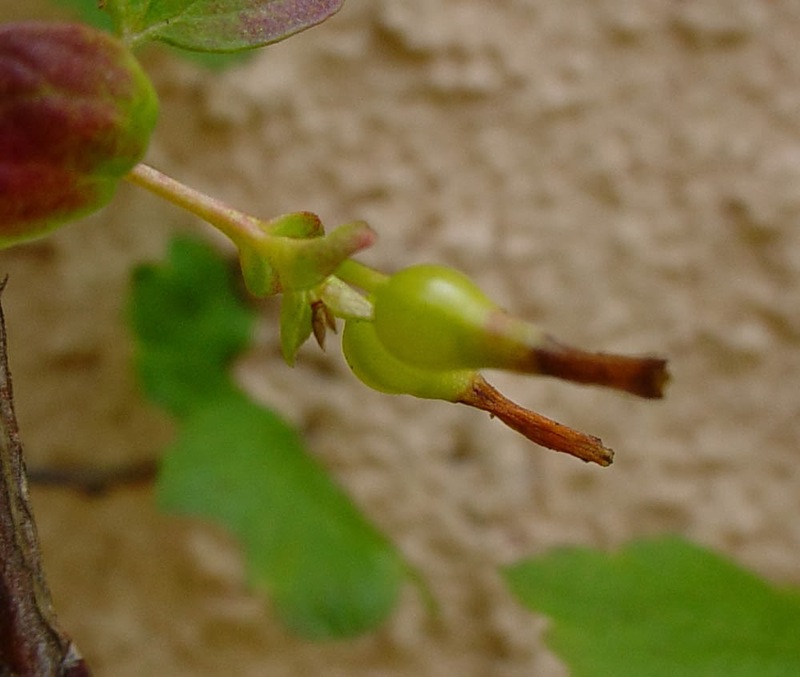 The current consensus is that Currants and Saxifrages are sister species; and that the Currant family contains a single genus (Ribes), although some taxonomists place the gooseberries into a separate genus: Grossularia. We’ll have to see how that debate plays out. The majority of Ribes species are native to the Northern Hemisphere (primarily North America and Asia, but also Europe); species from the Southern Hemisphere are limited to mountainous regions. Gooseberry species have prickles (thorns) on their stems; currants do not. Currants and gooseberries are grown commercially for fruit and also used as ornamental shrubs. There are over 25 different Ribes species native to California. 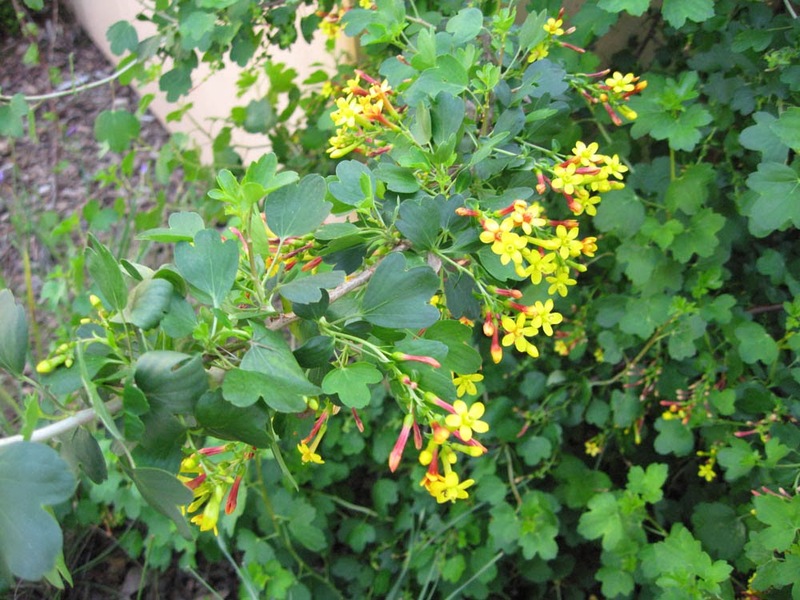 Southern California is blessed with several natives, including Ribes aureum var. gracillimum (Golden Currant), Ribes californicum var. hesperium (Hillside currant), Ribes cereum var. cereum (Wax currant); Ribes indecorum (White currant), Ribes malvaceum (Chaparral Currant), Ribes montigenum (Alpine Prickly Current), Ribes nevadense (Sierra currant), Ribes roezlii (Sierra gooseberry), Ribes speciosum (Fuchsia-flowering gooseberry) and Ribes viburnifolium (Island Gooseberry; Catalina perfume). Also commonly grown in local gardens is the showy Ribes sanguineum var. glutinosum (Redflowering/Pink currant), native to the Central and Northern California coast. Most local (Los Angeles county) species grow in the Santa Monica and/or San Gabriel Mountains although some are found on the Southern Channel Islands (Santa Catalina and San Clemente islands). Our local variety of Golden Currant, Ribes aureum var. gracillimum, grows from Northern California to Northern Mexico, but the parent species is found from Southern Canada (British Columbia to Saskatchewan) to Northern Mexico. It commonly grows along stream banks and other moist/seasonally moist places in shrubland, woodland and forest communities below 3000 ft (900 meters) elevation. Cultivated since the early 1800s , Golden currant is a woody shrub 4-9 feet tall with a spread of 5-10 feet. Like all currants, its stems are ‘unarmed’. Unlike some local species, Golden currant grows by adding new stems at the base and sprouting from rhizomes (underground stems). A young plant will have only a few stems – mature plants will have many more. The actual stem characteristics depend greatly on the amount of light the plant receives (see above). The stems are shorter, stockier and more erect in sunnier locations and more wand-like in shade. Golden currant is stress-deciduous, losing its leaves either during the hot, dry fall (locally) or with the first cold snap. The leaves are medium green with the three lobes typical of the genus (see photo above). The leaves become red- or purple tinged – and may become entirely red – in fall. In fact, they are a good source of fall color, along with ‘Roger’s Red’ California grape (Vitis californica ‘Roger’s Red’), in local gardens. 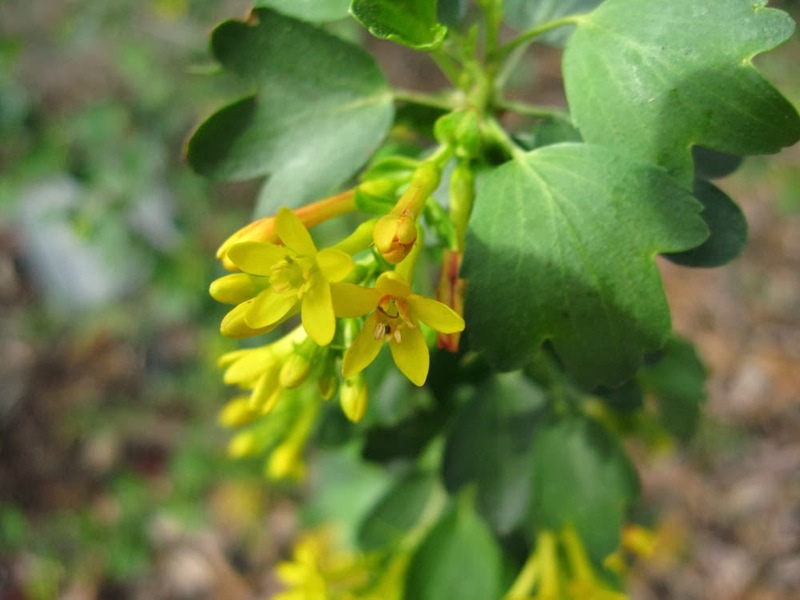 The flowers of Golden currant are a bright, golden yellow – in fact the name ‘aureum’ refers to their golden color. Plants flower early in the year – as early as February or even January in our area – and the bloom season is about a month. In colder areas, bloom season begins in March or April. 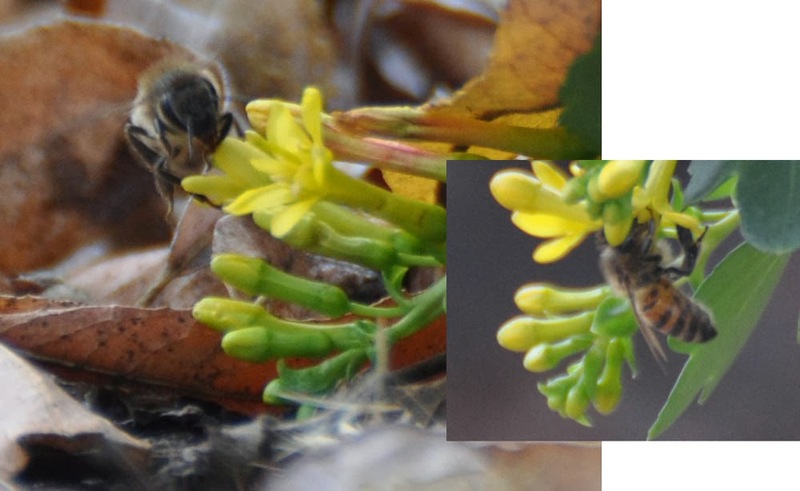 The flowers of Ribes aureum var. gracillimum often become more red as they age, an added benefit this time of year. The flowers have five petals and are ‘perfect’ (have both male and female parts). While individual flowers are small, the drooping floral clusters are quite showy (see above). The flowers of var. gracillimum have no/little scent, but this doesn’t deter the many pollinators that visit them. We’ve seen native bees (including Bumblebees), European honeybees and pollinator flies visiting our plant in Mother Nature’s Backyard. The most showy visitors (above) are Monarch butterflies and the Anna’s and Allen’s Hummingbirds, both of which are resident in the Gardena Willows Wetland Preserve where our garden is located. Plant any of our native Ribes if you want to attract hummingbirds. 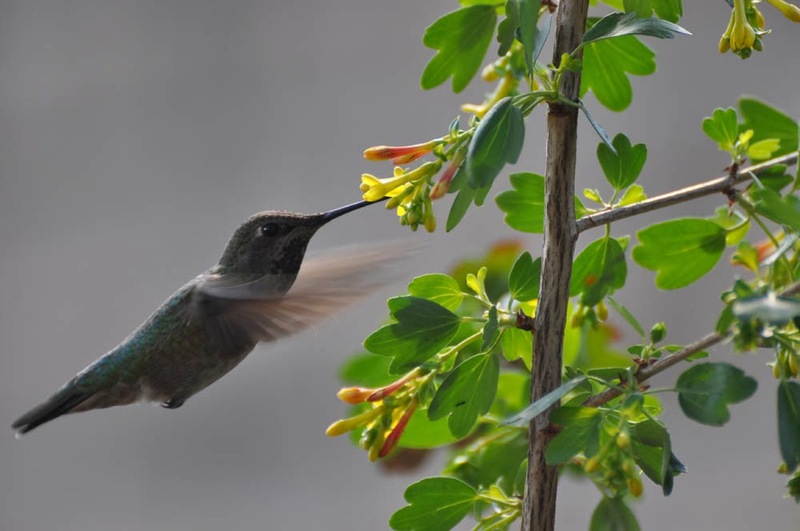 They will fiercely protect their currants and gooseberries from other hummingbirds/insects – and even scold you if they think you’re getting too close! The fruits of Golden currant are edible – in fact they are among the tastiest of the native currants. Ripe berries are a translucent orange to red or even dark purple. You’ll know fruits are ripe when the birds start gobbling them up. Mockingbirds, Grossbeaks, Robins, Jays, Towhees and others love the fruits. If you want some for your family’s use you’ll need to be vigilant. To learn how to pick, clean and save currants see: http://mother-natures-backyard.blogspot.com/2016/08/california-gourmet-preserving-summer.html. We’ll feature some interesting currant recipes later in the year. 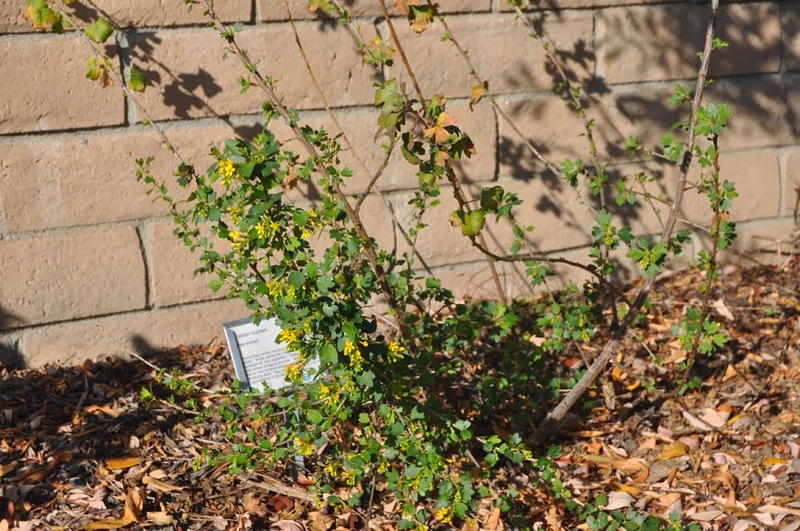 Golden currant is tolerant of a range of environmental conditions, making it a good candidate for gardens. We particularly recommend var. gracillimum for Southern California because it’s locally native and adapted to our conditions. It can be grown anywhere from near the coast to the hotter inland and foothill areas. Plants tolerate full sun only right along the coast. In most gardens, morning or dappled sun is ideal, although this plant will thrive even in bright shade on the north side of walls or buildings. In general, native currants and gooseberries like well-drained soils. That being said, many of us successfully grow Golden currant in quite heavy clay soils. The trick is in the watering, and Ribes aureum var. gracillimum is among the most tolerant of the native Ribes. It also tolerates a wide range of soil pH, from slightly acid to alkali. In a dry winter (like the present one) you’ll be wise to water your Ribes deeply, as currants need their winter moisture. Golden currant even tolerates winter flooding. Choose a cool, overcast day and water early or late between hot spells. In late spring and summer, mature Ribes aureum var. gracillimum can survive on very little water. We find they look best if given an occasional soaking – perhaps once a month or several times during the summer. If the leaves are becoming red-tinged, it’s probably time to water. Be sure to let the soil dry out between waterings; and overhead watering should be avoided. Like most Ribes, native or not, Golden currant is susceptible to fungal infections, particularly under warm, moist conditions. Plants are an alternate host for white pine blister rust (Cronartium ribicola) which infects white pines (those with needles in bundles of five). You can do several things to prevent fungal infections: 1) locate plants in areas with good air circulation; 2) don’t over-water, particularly during warm weather; 3) don’t plant near white pines. 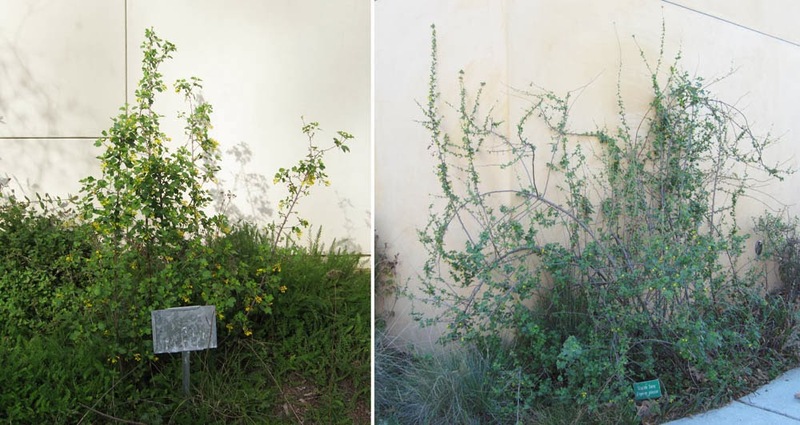 Golden currant is most productive – and looks its best – when pruned as the Native Californians learned to prune it. 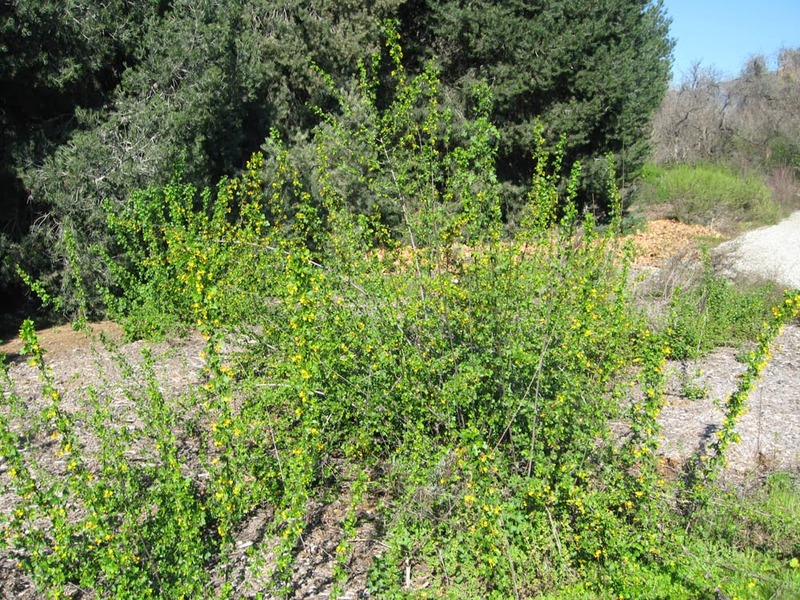 Native Californians value native currants as a tasty treat; so in the past, clumps of Ribes aureum were actively managed. Three-year-old branches are usually past their productive life - pruning out the oldest stems each year will keep your plants neat, healthy and productive. Start pruning after the second year of growth. Prune out the oldest 1/3 of the branches (down almost to the ground); then prune out the oldest 1/3 of branches when plants are dormant each fall thereafter. It is usually easy to tell the oldest stems, even when they are dormant. Golden current is often used as a shrub in local gardens. It can be informally espaliered along a wall or fence. It can even be used for an informal hedge or hedgerow (perhaps with suitable evergreen species). It doesn’t need much care, so it’s a good choice for hard-to-reach slopes (roots hold the soil) and other ‘challenging’ areas. As mentioned above, Golden currant berries are edible, raw or cooked. They can be used to make pies, tarts, jams, jellies, syrups and cordials. The flavor is very good. If planting a native currant for fruit, this is the species to choose. Native Californians used the inner bark, dried and pulverized or soaked in water, to treat skin infections and sores. In summary, Golden currant is a great native shrub that provides bright color early in the year, attracts hummingbirds, native pollinators and fruit-eating birds – and provides edible berries. We hope you’ll consider planting it in your own backyard.